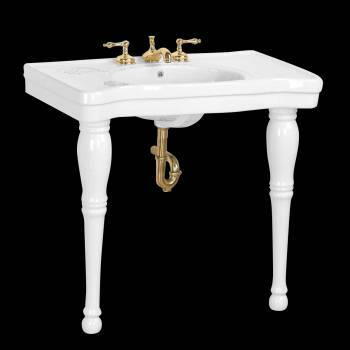 Console Bathroom Sink Belle Epoque deluxe console sink, brings a sense of luxury and authenticity to your bathroom while remaining practical and durable. Get your top quality, hard to find Spindle Leg Sinks here today . Features: - Made of Grade A Vitreous China - Belle Epoque features a Reno-Gloss scratch and stain resistant finish on its wide ledges - Comes with self draining soap dish and a protective splashguard rim. - This listing comes with two elegant spindle legs constructed from furniture-grade birch wood. - The Belle Epoque uses an 8"" widespread faucet (NOT INCLUDED) - Ergonomic height reduces daily strain. Dimensions: - 33-1/4"" Height x 36"" Width x 19-3/4"" Projection. Other Details: - Item 12093 - Features authentic Renovator's Supply logo. - ASME and ANSI compliant. Choose your top quality Spindle Leg Sinks here today.